When I started this blog back in January I could not have predicted that it would turn into a vegan recipe blog. While I eat vegan whenever I can, I do make exceptions from time to time. For instance, if I go to someone’s house for dinner I do not expect them to go out of their way to cook vegan, nor do I want to isolate myself in social gatherings by being the party-pooper that says, “I can’t eat there”. When I have the option I eat vegan, and I very easily make exceptions to eat vegetarian, and even with family or friends I will eat meat: “flexitarian” or “opportunivore”, as I like to call it. Another one of my exceptions is when I bake for people. If I can easily make the recipe vegan I will do so, but sometimes it just isn’t possible. For instance, with this recipe, I have no idea if there is a vegan equivalent for egg-white peaks. If you know, please let me know! This recipe for lemon poppyseed muffins is from a cookbook called Tate’s Bake Shop Cookbook by Kathleen King, which was given to me by the owner of Life of Pie last Christmas. I highly recommend this cookbook; everything I have made from it has been scrumptious, and all the recipes use excellent techniques to produce a top-quality product. I made these muffins for my stepfather for his birthday. First off, I added the vinegar to the milk and let it sit for about 5 minutes. In a medium bowl, I combined the dry ingredients (flour, baking powder, baking soda, and salt). In a large bowl I used an electric mixer to cream together the butter and sugar until it was light and fluffy, then added the egg yolks one at a time. I then mixed in the lemon rind and vanilla. The next step was to add the buttermilk and flour mixture to the wet ingredients, in alternating additions, and making sure to finish with an addition of the dry ingredients. The poppy seeds were folded in next. In a medium sized bowl I whipped the egg whites to soft peeks; this is the point at which the peaks raise slightly when whisped with a spoon, but not hard enough to form solid peaks. I gently folded the egg whites into the muffin batter. I spooned the batter into 9 muffin tins, lined with muffin papers, and greased. The muffins were baked for 20 minutes at 400 degrees Fahrenheit, until a toothpick came out clean when inserted. The batch that I made baked for about 22 minutes. These muffins are fluffy and moist, and can be made with any other kind of citrus zest if you’re feeling adventurous. The recipe in the cookbook called for orange zest. 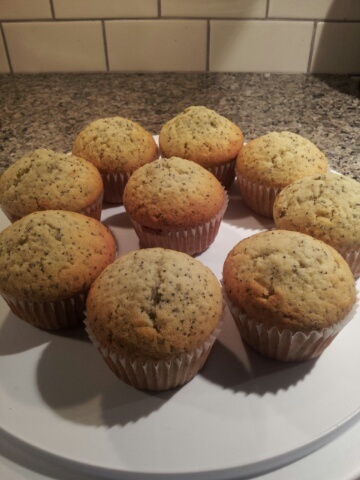 And as the stepfather who was the recipient of said poppyseed muffins, I can attest that they are indeed delicious – moist, tasty, not too firm, not too squishy, everything a muffin should be. They travelled with us to Toronto where we spread their joy a bit, and I personally finished off the last one.